T is for tension, Take That and TT! It seems ages since I was last here TWITTERING on but we are without internet access in our village and have been for the past few days. It is affecting those of us who use BT Broadband - AOL, Virgin users are not affected so I am using a local cafe's internet facility to catch up here, and more importantly to see what everybody else has been up to. I can tell you, there has certainly been Tension in the household - the BT problem occurred as we were making our very first sale on Ebay!!! However, I was pleased to see the Aga go to a new home in Hull. A lady had wanted an Aga for years and being the good chap he was, her husband had the winning big on ours. Last night (Monday) he drove up from Hull, together with a trailer to take our beloved Aga to it new home. Yes I was emotional, yes I cried but felt reassured that it would be looked after in the new home. It has been part of our family for 20 years, in fact we bought it during the very first months of moving to our current home so the kitchen seems very strange without it. I am sure the picture of an Aga is somewhat rose-tinted against the harsh reality of seeing one dismantled, lying in various piles around the kitchen, not to mention the dust and soot. It was all nicely cleaned and hoovered ready for the collection, nearly at the cost of a vacuum cleaner I can tell you! The Aga is packed with an insulating material which looks like grit - certainly of the same size and consistency - but there was tons of the stuff packed around the internal workings - which, to cut a story short managed to escape from the cleaner and distribute themselves around the kitchen - the dust cloud was like something from a science fiction movie and it didn't help my sore throat! Why a sore throat......well on Saturday I had been singing along at the TAKE THAT concert in Sunderland! It was TERRIFIC I can tell you, we had the TIME of our lives. I think I have just recovered - in TIME to prepare for our annual TRIP over to the Isle of Man TT on Saturday. The arrangements are all made, ferry and hotel booked, Elsie, Freida and Ella booked into their various places of luxury accommodation and neighbours looking after hens. We are away for 8 days and I am sure we will have a fun time! It will be a good break from the work we have been doing - and indeed on our return the work will resume - talking of resuming work - I guess it is time for me to return home and chisel away at more TILES! The joy of DIY eh? Watch this space - not sure when I will be back - but as TAKE THAT said - when I am back, I hope I will be Back for Good! lol! For more ABC fun, follow the link in my sidebar. The dresser is up for sale! It has been packed away in the shed for quite a few weeks now and the kitchen seems very different without it, but all things considered it is the right thing to do. The top is an original linen press, we had the drawers made to compliment the press so it all fits together in proportion. My late neighbour had the linen press in her pantry - it was used to store tins of dog food. The doors were originally filled in with cardboard and newspaper - a far cry from what it looked like after we restored it. Whilst I am SAD to see it go, I know it will go to a new home where it will be loved and treasured, just as it was here. The top photograph was taken a few years ago - the blue object is a fairing from one of our motorbikes which we had a little drop on! It was just a cosmetic repair - costing best part of £1,00! When we sold the bike Jon told me to take it down - not a good thing for a prospective buyer to see! lol! Looking at the dresser (press) it has been used to store my various pieces of kitchen memorabilia over the years, but I have conflicting views over saving such stuff - it should be used really, on a regular basis. I tend to keep things "away" and then get upset if something is chipped when used. The consequence is a large collection of items never used - something I am hoping to address when the kitchen is revamped. What special kitchen memorabilia to you have? and how to you use/display or store? Never done this before - so it is all very exciting! With under 2 weeks to go before we go on our annual pilgrimage to the Isle of Man we are now taking a rest from the DIY around the house. There is little we can do to be honest as once the Aga is removed and dismantled, the concrete plinth will have to be modified for the Rayburn. This is because the flu is located on the right hand side of the Rayburn, unlike the Aga where it is central. The flu goes straight into the chimney and as we don't want a flu-pipe on a severe slant we will re-position the stove itself. Jon will have to assemble a new plinth which he will do when we return. Once this has set we will be able to re-position and modify the units. 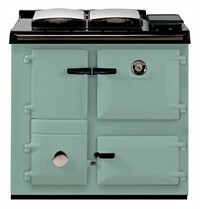 The Rayburn is due to be delivered 2nd or 3rd week of July and everything will need to be in place by then. Normally I feel quite flat when we return from holiday but this year it couldn't be further from the truth. Jon has spent the last few days negotiating prices, delivery dates etc and we finally went with our local dealer. The deposit is paid and delivery will be around the second week in July. The flu is on the right hand side, slightly different to the Aga so some moving and shaking will need to happen, but not until the Rayburn is in situ. Jon will have some lights to sort out in the kitchen, and the ceiling will be plastered BEFORE the Rayburn is delivered, but that is all we can do really - well in the kitchen anyway......so the lounge is now our focus. For more ABC Wednesday fun visit the link on my sidebar. but the dining area will be at the front of the room. The doors at the right hand side of the picture look out onto the garden and it is still a bright room. The curtains need hemming which we will work out more accurately when the carpet is down. We have a large expanse of wall which we are working on next. The fireplace has been removed. This is not a wall with a chimney - only a flu for a gas fire. We had constant problems with the gas, bottled type as we do not have mains gas in the village. We are going to have a wall mounted modern electric coal effect fire and Jon will build a false chimney breast to give the room a feature, bookshelves etc will then be planned for the recess. The laminate floor is being replaced with a carpet. The laminate has been down for 12 years but we really want a carpet. The noise from the floor - ie 2 german shepherds tip tapping across the room of a nightime does become rather tedious. We will be drawing up our plans later this week and then work will commence. We will also be ordering the Rayburn which will look something like this - but ours will have a flu. Colour is Aqua - I think it will match the colour scheme going on throughout downatairs. So - back to work! Watch this space. Today the carpet took its place in the snug - so apart from the roman blinds, the snug is now finished. I have used existing furniture but we did buy some new lamps yesterday. We were particularly impressed by this mood light. You turn it on by touching the base - touch again for a brighter light and again for the brightest setting. The nest of tables were mums - not sure if I will keep them in this room, but they are good for now. The clock was a wedding present from my class back in 1988. We replaced all light and power sockets with brushed steel - so much better. My neighbour and I are going to be using the fabric I shared here to make a roman blind.......should be interesting! So the snug is complete and we have now started on the lounge! Gluttons for punishment eh? Still, we can relax in the snug and shut the door at the end of the day. Will keep you posted of the next stage! For more ABC Wednesday contributions follow the link on my sidebar. This has been circulating for a few days - hope it brings a smile or two - it's raining here so pottering! My diet seems to be back on track, with last weeks determined efforts bringing a 2.5lb weigh loss. I had a couple of weeks which were not particular good ones – a few fish and chip episodes did not help and there was the wonderful day of feasting with friends – so I had to get back on track. I am eating lots of healthy salads, boiled eggs from our lovely girls and lean meat. I have also been experimenting with Quarn chicken style fillets – just sprinkling lemon juice, chilli, pepper and salt onto them – quite delicious. I am back at a stone loss so I need to keep focussed as I go into the next phase of losing another half stone before we go away to the Isle og Man on June 4th. This is achievable – to lose 7lb! I don’t like to go on too much about “The diet” as I try to be a woman of my word – but by saying I WILL lose 7lb by June 4th means I think I can – well put it this way – I bloody well will! There may be light at the end of the tunnel – but it was somebody with a torch showing me the parts we had overlooked! Yes, we are very very nearly ready to lay the carpet in the snug! The carpet is here, the carpet fitter, our good friend Spud is ready with his stanley knife and gripper rods……but there are a couple of finishing touches we need to address before I open the door and share with the world. The underlay has been delayed – apparently there was a problem with the courier finding us (common) and the doors need another coat of gloss. Being realistic – we’ll be in there by next week! A whole week since i last rambled here – but believe me we have been busy! The Royal Wedding – I even put the flag out for the binmen! lol! (refuse collectors to our US friends!) The local council worked as normal so I gave them a couple of my sandwiches made specially for the day. Salmon & Cucumber and Roast Beef & Horseradish. Some neighbours popped in and we had Pimms & lemonade – how sophisticated I hear you comment! 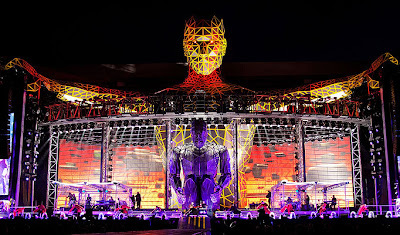 I thought the whole event was quite spectacular! On Saturday we had the perfect excuse for a tootle over the Yorkshire Dales on the motorbike as we had to deliver an order to one of Jon’s customers. We travelled via Bedale, Leyburn, Hawes to Kirby Lonsdale and home via Harrogate. A great day! On Sunday we tootled over to Grosmont Station. There is a gala on at the moment, so it was great to see some of the all time favourite steam trains – including Sir Nigel Gressley. Jon stood on the footplate when he was 10 years old so it brought back many memories. We had been very busy in the garden that morning – the size of the bonfire indicates the amount of garden pruning we did! Yesterday we spent more time in the garden but had another tootle out in the afternoon to buy a new radiator for the snug. It will be fit this week, along with the carpet. Oh and guess what? 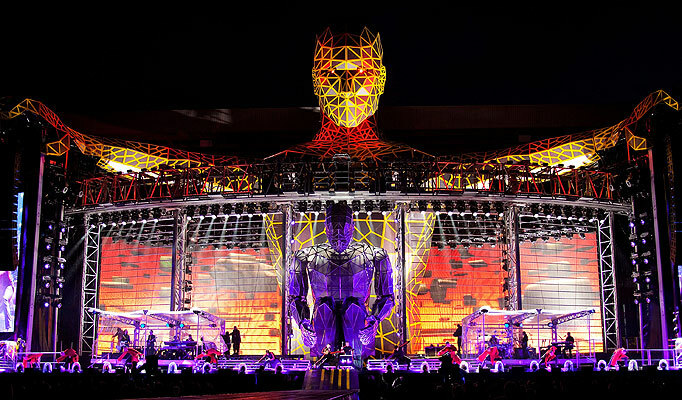 I am off to see Take That on May 28th! So that is what I have been pottering with – do you potter? For more ABC fun – follow the link in my sidebar!